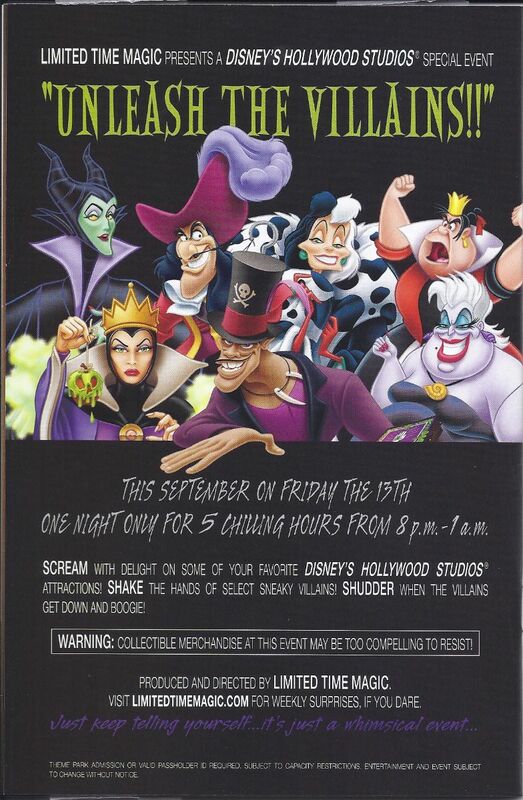 As a part of Limited Time Magic, Disney’s Hollywood Studios will host an “Unleash the Villains” party on Friday, September 13, 2013. The event will take place from 8 pm to 1 am. Few details have been disclosed, but a recent passholder newsletter confirms a dance party and special merchandise. This will not be a hard ticket event, so daily admission is all that is required to attend. We look forward to bringing you live coverage of this event next month! What do you think? Are you looking forward to this event or do you think it will be another limited time bust? Please leave your thoughts in the comments below. Yes! I love Disney Villians and this will be our last night when we go. We had thought about doing MNSSHP but we did that last year and this looks awesome. Yea!! I was there last year when the holloween party started. There was no advanced warning and my great niece was with me. We had just completed a ride that she found very scarey and then coupled with the Halloween noises she was beside herself almost to the point of being terrified. It took us until we were back at the hotel for her to calm somewhat down. There has to be a better way. Like a 10 minute warning before the music would start. Not to mention it was piped all over the place. We got into one of the trams that took us where we were dropped off by the hotel and even when we had to change, the music still haunted her. It made what was to be a great day in Disneyworld a very horrifying experience and there was absolutely nothing we could do to help her. It is sad when she thought SeaWorld was better than the Magic Kingdom and when asked why it was better than meeting all her favorite characters it came down to the ride then the music that scared her. Hopefully it will be better at the Hollywood Studios. I’m sorry to hear that Cindy but something tells me the event at Hollywood Studios is going to be scarier than what was experienced at the Magic Kingdom. If your daughter was scared of just the music I have a feeling she won’t do very well actually seeing the villains in person. May I ask what ride you were on that she thought was so scary? Just want to post a friendly reminder that the Hollywood Tower of Terror is a scary ride all around and that attraction is located at Hollywood Studios. I cant remember the name of the ride – while you are waiting you are walking thru a cemetery. The actual ride has ghosts appearing in your “car”. I was also reminded that the Magic Kingdom advertised the Halloween as a friendly not scary Halloween party. The tower of terror did scare you because it had ghosts etc, it was scary because of the feeling of freefalling. Cindy, you just described the Haunted Mansion. And trust me if your daughter from that ride’s music scary it won’t be a pretty sight for Tower of Terror. Tower of Terror doesn’t scare me but I know the creepy interior, the Twilight Zone music, and the fact you see old hotel guests as ghosts for a brief couple of seconds is what can be considered scary if your daughter feared the Haunted Mansion. The hour of loudspeaker announcements about party start times/making your way to exit are a good warnings. Sidenote: anything with the words ‘haunted’ ‘pirates’ ‘villians’ ‘boo’ ‘mountain’ or ‘terror’…maybe avoid. We WERE making our way to the exit. We were by the gate at 7pm and the music had already started. It was to be a FRIENDLY Halloween party. We were not going to stay for it. Obviously your comments make light of what was a disturbing 1st time visit for a child to the Magic Kingdom. To Lexi – you are right – the Tower of Terror was fine for me but my great niece wouldn’t have made the height requirement and handled everything. Her mother thought it was going to be ok and try getting out of the line when you are pushed forward. I couldn’t find an exit and she went on thru the Haunted Mansion which started it all off. I agree. Disney should completely refund your money, pay the therapy bill for grand niece, then remove every element from their parks and films that could possibly frighten her ever again. Would that finally appease you, Cindy? My 5-tear old’s sudden realization that the Haunted Mansion was scary took a hug from daddy, a Dole Whip and some perspective before she chose to brave it again. And again and again. And it was her station as part of Disney’s College Program. Now she writes about all manner of the supernatural. There’s a point to this story, but I’m certain it’s lost on you. By the way, before you take her back to SeaWorld, be sure to take her to see Blackfish first. Now that’s truly scary. Given that I was there last year as well and love with an MK Cm, I can say absolutely no scary music is played in the park. Just children’s Halloween stuff like witch doctor. And no rides are changed at wdw for Halloween. Absolutely no reason for you to subject an easily frightened child to a haunted mansion….duh….ghosts are implied in the name. And if you were looking for the exit, why did you go on another ride prolonging your stay?? Fault lies solely on you for that. Sounds more like a bunch of dramatics for attention to me than a legitimate issue. OK OK OK I have had enough…. stop dumping on me and Jennifer you are almost a month late with your latest dirt. Knock it off. I have a right to my opinion and you have no idea what happened with my Great Niece so keep your two cents to yourself. (As an FYI that WAS the last ride and we were trying to get out of the park and did NOT go on another ride). I have hade enough of this crap from everyone who feels they have the right to continually make rude comments. A day or two of these remarks are way more than enough. Man I wish I could sneak down for a day and attend this! Sounds awesome! Rude doesn’t become you. I was explaining what happened with my niece. Too bad a man that calls himself “Disney Dad” can’t understand a child doesn’t always have the reaction we hope they will have and be the perfect child after a long day at the park. Things happen. Stop being a bully. Like I said, you missed the point. All ages scare for many reasons. Hi Guys! I’m thrilled to see all these comments – you made my Monday morning! 🙂 But please be kind to each other. I know for me when I’m at another Disney park that isn’t my “home” park it is a sensory overload and I can walk right by things that are painfully obvious. Also, I think most people go into WDW thinking there is nothing to scare a small child but that isn’t always true. There are things in each park (and seasonal events) that can be too much for the little ones. We detail those out in the Official Guide and you can find lots of information online. But no matter how much you research you never know how your child is going to react! That is one of the adventures of a WDW vacation. Cindy – hopefully your little one will have a better experience on her next trip. For what it’s worth I doubt this event will be very scary. It sounds like another dance party on the big hat stage! My sister and I have been planning this trip since we first heard about the event. We are so terribly excited. We get to do this event, my first MNSSHP and we aren’t bringing the kids. I am looking forward to a trip full of villians…..yeah!!!! My neice (17) and I are going down at that time. I was very excited when I heard about a special event. This will be her second time at WDW. The Haunted Mansion has several “chicken exits” before you board the doom buggies. Also I can guarantee that no one pushed you and your child on the ride. That is absurd. There are many MANY warnings before the Halloween party starts and heaven forbid they play Mickey’s Boo to You to set the mood. You should do your research before attending a theme park. Don’t blame cast members for your child’s anxiety. Plan ahead and avoid these “frightening” occurrences. I’m a Diz newbie so please excuse my probably stupid question. Does having this party in HS mean that any/all rides will be open until 1am? If you compare MNSSHP to other parties at other parks, it really isn’t that scary. Also every child is different in what they’re afraid of. Parental research would be a smart thing to do. Then you can either decide its too much for your child or take the time at home to prepare them before you go. There is a ton of info on the party on the Internet. Including videos. Even if you weren’t attending the party it would still be smart to be informed. Same thing about the attractions at the parks. Do your research ahead of time to prepare yourself & your child for what might happen. If you had done your research you would have known what type of rides to avoid for your child. A ton of info on the Internet & ride videos too. There are a few chicken exits before you board your doom buggy. If you’d have mentioned to a cast member that you’d changed your mind, the rides too scary they’d have shown you the exit no questions asked. Quite a few people do this. I’m sorry she had a bad experience but it could have been avoided if the parents/adult would have done their research. Or even before going on the ride asking a CM about the ride. Will we get a chance to meet the villains and have photos taken with them? I am thinking that since this is a Villains event that there will be photo opportunities to have your pictures taken with them. Wow,Great post…Thanks for providing such a useful info.